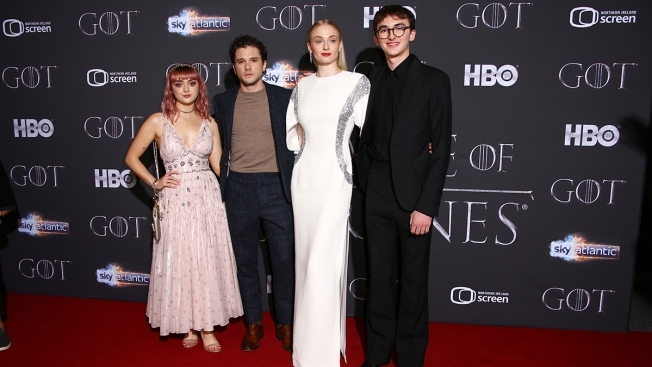 Actors Maisie Williams, from left, Kit Harington, Sophie Turner and Isaac Hempstead pose for photographers at the premiere of season eight of the television show 'Game of Thrones' in Belfast, Northern Ireland, Friday, April 12, 2019. Emilia Clarke is thankful to be alive. In a new essay for The New Yorker, the "Game of Thrones" star opened up for the first time about secretly suffering two brain aneurysms during the early seasons of the mega-popular HBO drama. Watch for more details on her near-death experiences. 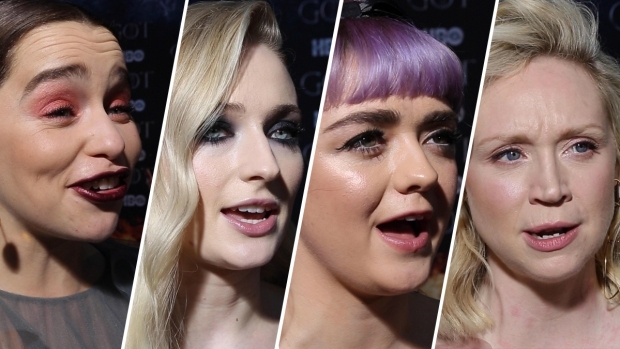 Maisie Williams shares her top five iconic moments portraying Arya Stark on "Game of Thrones" and gets upset when she accidentally lets a major spoiler slip about a big death while trying to describe the show's final season. Conleth Hill talks about having to keep his head shaved to play Lord Varys on "Game of Thrones" and giving his extra premiere tickets to Debbie Harry.